SOUTH CHINA SEA (Nov. 27, 2008) -- The "other woman" finally met Scarlette. My wife doesn't share the same passion I have for Scarlette and boating in general. But since she can't cook Turkey (our stove is just too small) and we both had the Thanksgiving Holiday off (it's an American federal holiday for us here too) she kind of ran out of excuses as to why she couldn't come aboard and tool around off the coast of Chatan, Okinawa on the South China Sea. 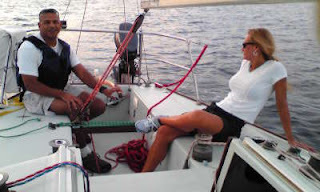 Since owning the boat last May 2008 this was the first trip "the other woman" had made on Scarlette. But she admitted, that she wished the boat could go faster. Maybe Scarlette was a little jealous and didn't want to show "the other woman" a fun time. 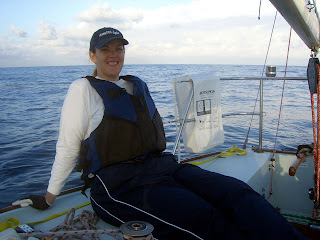 I'm batting 0 and 2 with my wife when it comes to sailing. 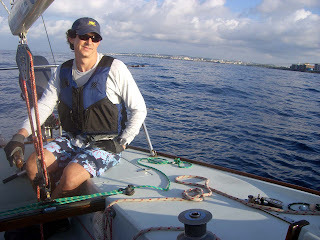 After getting my sailing certification last year we went out on a rental Catalina Capri 18 and that trip was a total disaster. No toilet onboard -- Had to return to harbor once as she refused to "hang it over the side." No control at harbor. 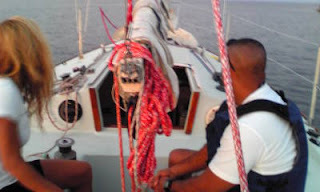 I crashed into another boat which luckily only set me back about $150.The owner was extremely gracious and was glad that I had approached him and was honest about what I had done as opposed to docking and dashing. At least Scarlette didn't make her sick. But it probably won't be until my birthday that the "other woman" and Scarlette meet again. As for Thanksgiving dinner -- after Kai and I secured the boat -- we met Tomoe for lunch at a new Vietnamese place. She ordered Green Curry, I ordered Red Curry and Kai had noodles. A real "traditional" meal for us as we typically eat out on Thanksgiving Day. 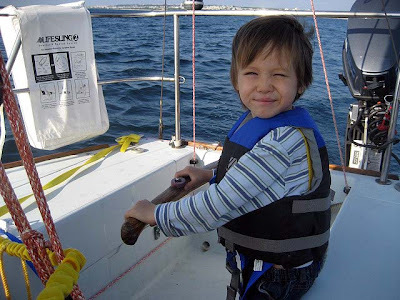 Nov. 23, 2008 -- SOUTH CHINA SEA -- Kou Johnston completed his first trip as a deckhand aboard Scarlette -- a 23-year-old J/24 sailboat -- just 13 days after his fourth birthday off the coast of Okinawa in the South China Sea. Capt. 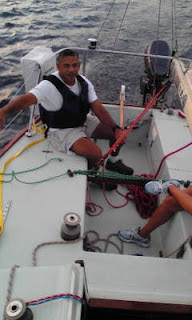 J and Kou's older brother -- Kai -- also crewed aboard the 24-foot, sloop-rigged racer/cruiser built by Nissan in 1985 under license with J/boats. 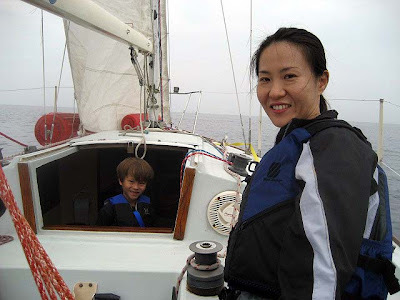 "I tethered both the boys to Scarlette to help avoid a man-overboard situation," said Capt. J. 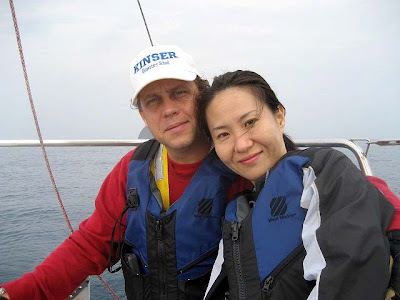 "Kou didn't get sick and he seemed to like standing back by the rudder when I was at the helm." "It was fun," said Kou. "I want to go again." "That's music to my ears," mused Capt. J. "One of the reasons why I bought Scarlette was to do something with the boys that we could all do and maybe teach them a skill, too." 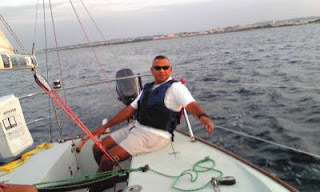 Kou seemed at ease aboard the sailboat as he cruised the coast of Okinawa's Chatan Town home to Mihama's American Village. The restrictions of a tether took Kou a little getting used to. Kai also helped Kou get out of his harness to use the "facilities" aboard Scarlette. "That kind of teamwork, is what I'm trying to inspire in the boys," said Capt. J. After landfall, both boys seemed more interested in the tropical fish dockside than helping to breakdown the boat. "That's a skill we'll be working on in the future, too." said Capt. J. 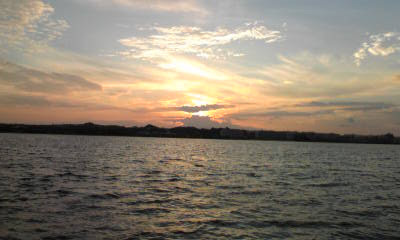 The sun rise on Okinawa as seen about 1/2 mile off the coast of Chatan's Baba Koen. 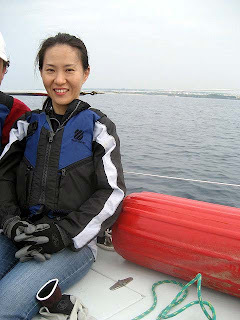 11/16/2008 -- SOUTH CHINA SEA -- Light winds may have made it less impressive, but it also probably made one crew member a little less sick during Scarlette's trip along the coast of Chatan in Okinawa. 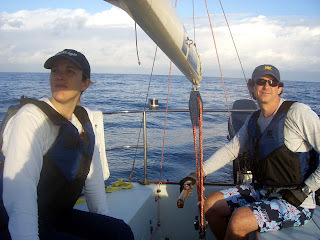 Laura Stoller joined Kenny Vergler and Captain J for an early morning that was slightly delayed by the purchase of gasoline for the boat. A full two-gallons worth. Laura arrived at Kadena Marina around 5:30 a.m. and I told her that I had to go get gas and returned around 6 a.m.